Met a few friends since I got back. It's really nice catching up with them. Met up with Nina in Seria for lunch :) I just remembered I met up with Kelly first but forgot to take a pic with her so that's one missing piece right there. Bummer. 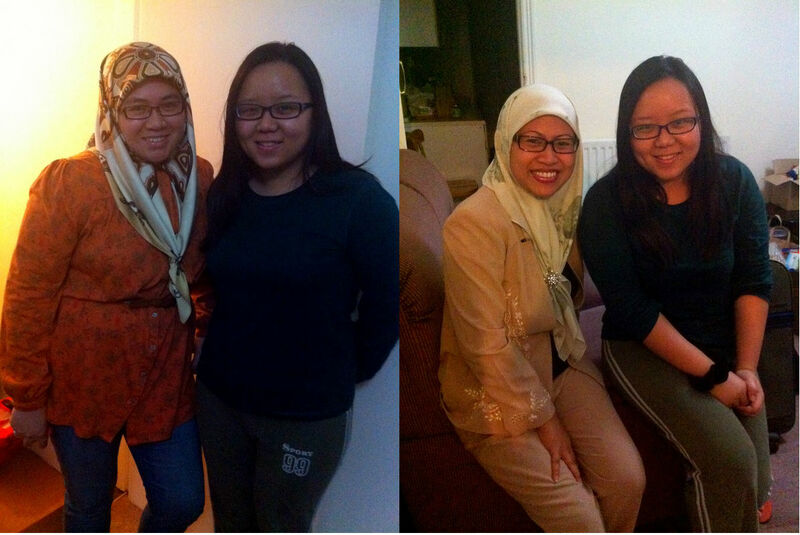 Met Mijah for dinner last week. Thanks for bringing me to that new KFC! Bumped into Li Wen at the Mall the other day. Technically not a meet-up but I really miss talking to Izzy so a FT will do for now. Bumped into Haniff at FOS! On a Sunday morning, I drove Sharon's car to Seria and drove dad's car back. Needless to say, with my driving skills, I find driving auto and manual equally daunting. The road constructions at various places felt like they were adding insult to injury. Of course, I say this with slight exaggeration as always but I stand true to the fact that I don't drive as well as I wish. This is Sharon and I after our breakfast marathon. Her birthday is coming up so I'm very excited. Why am I excited? Because I haven't tasted birthday cakes for a long time so that's something that I can tick off my must-have food list. After this, I should probably put this in my must-not-have food list. My brother kept nagging me to bring him to OGDC that morning so I, being the awesome C-C-C sister that I am, brought him there under the hot morning sun. He's not exactly a kid anymore to be frank. I mean, just look at him giving a go at the slide. You know you're too old for a slide if the length of your body takes up half the slide. But hey, what's important is that you have fun, right? Right! 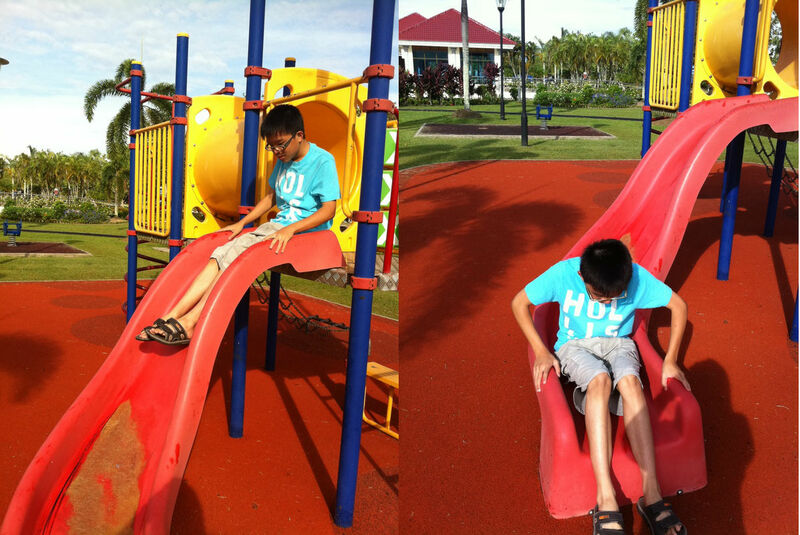 So I gave the slide a go too. But I struggled getting up. Man, I need to do more exercise! We were like giants among those play structures! And of course those famous mini buildings at OGDC are not to be missed. Here's Stephen stomping the ground of the HQ. PAKAT! And here's me sitting on SMSA. I went to two schools with the same exact structure many years ago so moving to that second school was kinda weird because it felt like I've been there before. And this model is a replica of my old schools so it's kinda nice that they make mini versions of them here. My posts are actually way behind because pictures are piling up. I don't know. Should I post all of them or skip them all? The thing is, I don't know what's my purpose of posting stuff. Sometimes it feels like a routine that I've been doing for 5 years. Other times, I just enjoy posting pictures and writing. Whatever it is, I do hope readers enjoy reading my blog as I do writing them! Growing up, this place used to be my favourite destination, and all kids for that matter. God knows how this place can turn from the ultimate theme park to one where no one even care to take a glance. It's just such a shame. Well, Mimi and I decided to revisit this place. For old times sake, I guess you can say that. The last time I stood here, triceratops used to rule the world. Hey, the fountain still works! Okay, its not as run down as I thought. Still...it's like a ghost theme park here. I recommend you come to JP just for the tongkeng. Seriously. The camels are still alive! And Mimi managed to get on one. I still have that photo of our family posing with this camel. Need to fish that out for comparison! 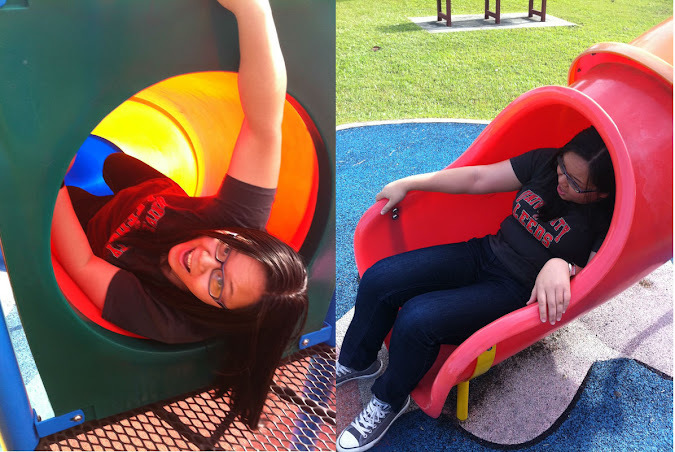 Of course, seeing Mimi climbed on that thing, I also wanna try myself. Obviously, I failed. We would've gone further had it not been the rain. It never fails to rain everytime I visit this place! After all these years you would've thought the curse is lifted but nah, rain persisted. So our adventure was put on hold. But as Arnold says, "I'll be back!" Fished through my folders and realised there are quite a number of photos that I've moved into my storage and forgotten about. These are all from last month so here goes nothing. I "reunited" with Izzy again when I went back to Leeds to get my project feedback last month. It was so lovely to meet her and I miss hanging out with this girl! Below is the last picture I took of Leeds before the bus took off. It's such a beautiful city and it has been my home for a year so it will be dearly missed. Here's me on my way to the park in B'ham. I was walking along this road where the neighbourhood looks serene and peaceful. It was just a wonderful day for a walk. This is our regular bus stand next to UoB where we usually take the bus from here to the city centre. There's something about this city that I like. Well, I grew fond of this city in less than a week! Staying with Mimi for two weeks, I met her two lovely housemates and I really want to thank them for having me while they were busy packing that two weeks. So these are the missing pieces from two posts down. I'm not really sure what readers want to see actually but from now on, I'll probably post pictures taken locally rather than overseas so if you're here just for the UK pictures, this will be the last of it. I've ran out. Sorry! But I hope you'll continue following me here because I promise to post pictures, even if it means pictures of grass and trees! It's probably a good time to do this tag because I have nothing to update. I got "unofficially" tagged by Shely the other day and if you wanna see the content of her bag, click here. After seeing her stuff, I realised how little I own. I don't have one single makeup in my bag and I have no keys! Such a shame. But here's what I do have in my bag for stalkers and whatnots. This is my very simple targus bag that is conveniently big enough to put in all my purchases without having to hold them in a separate bag. And these are literally all I have in my bag at the moment. Top left: umbrella (something I can't live without), tissue, tic tac and a hand sanitiser I just bought yesterday at Guardian. 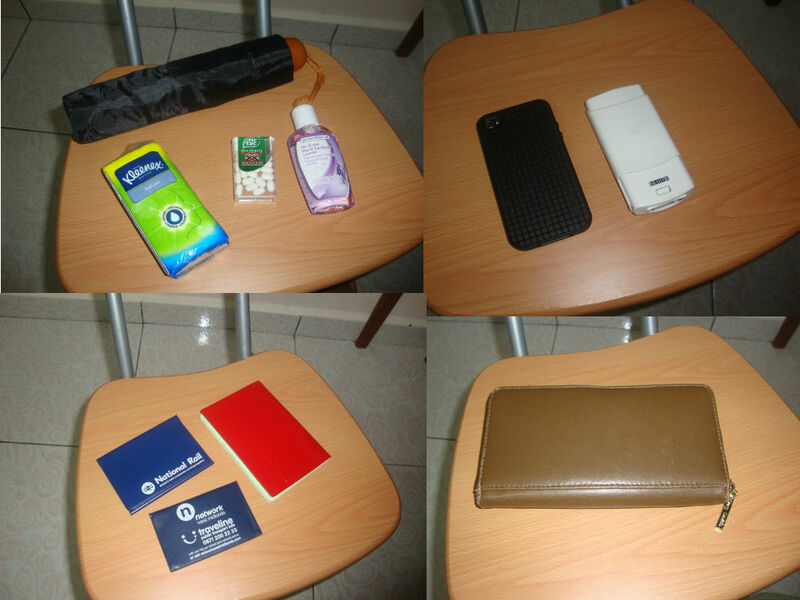 Bottom right: the basic essential, a wallet. And of course I also have in my bag this digital camera which I used to take these photos but have no other camera to take a photo of this camera. Sigh. I'm bored writing this up already. I must be the owner of the most uninteresting bag in the whole world. But then, I don't like messy bags so I guess I shouldn't complain about this one. At least I don't have rubbish in my bag cos I've seen people with bags that have old receipts and used tissues and I don't know how they can go about their lives not caring about rubbish in their bags. I simply can't! I'm finally home now after being away for a year. What's my initial thought on that? I told my friend there is a mixed feeling. Wherever you are, there is always something that you can take away from that place and no doubt I've had the best experience of my life studying in the UK. The things I've done in that one year are more than I ever did in my whole life and I'm glad I got persuaded into studying abroad in the first place. It's funny how it felt like just yesterday when I embarked into the foreign land. A blink of an eye and here I am back again. It feels almost like a dream. Here are some photos I've been meaning to share with you but never got the chance. But since its been quiet at home nowadays, I thought it'd be nice to share these with you now. This is the street where my friend and I busked that August while we were still in the midst of writing up our dissertation. It will be one of those places on earth where I will never forget. Busking may not sound like a big deal for people in the UK or anywhere around the world but for people from this corner of the earth like me, busking on the street is quite the adventure. This is my regular route to the computer cluster when I needed to do work on the school's computer. I love how scary it can get especially when I need to walk this route at 3am in the morning. It kept me awake all the way through. This is mixed grill with cheesy fries at Tinseltown in London. It's extremely meaty and very high in calories I presume, therefore not recommended if you're on a diet. On the upside, it's delicious. I had this when I was in London with Mimi a couple of weeks ago. The food adventure in the UK was quite fun because they do have quite a number of dishes that you can't find here. My favourite is a tie between shawarma and chicken tikka. Mimi loves Costa so whenever you see me posting a picture of Costa drink, you know I'm out with Mimi. Likewise, if I'm seen with a Starbucks cup, you know I'm out with Izzy. I'm generally not a coffee person so you'd never catch me going inside a cafe by myself. I'm more of a fast food junkie. I saw this at Sainsbury's the other day and I almost wanted to get it but its too big and I don't think I can finish eating this but still...it's Spongebob! This is going to be my next birthday wish. These are the UK versions of AirAsia. Cheap flights, FTW! We used both Jet2 and Ryanair when we went to Italy. 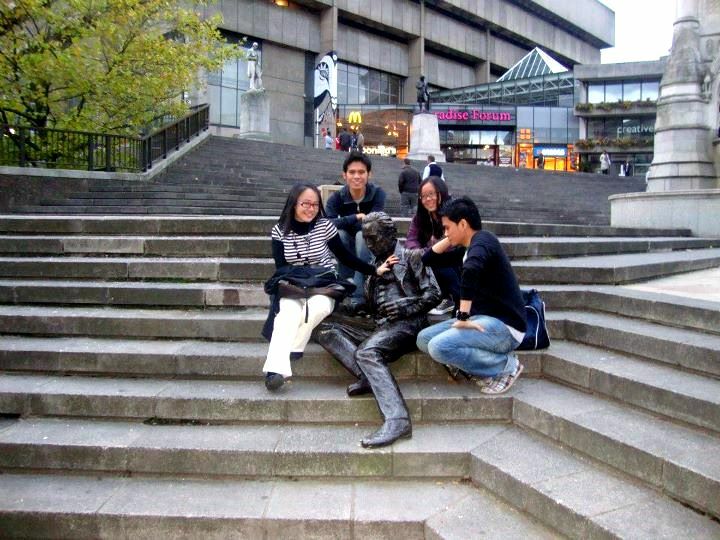 In Birmingham, we met up with the twins. I haven't seen them for ages so it was nice to catch up with them. This is the transit at the airport in Dubai. Not much to do here but walked around like everybody else.